Sena Technologies is the global leader in bluetooth communication systems for the Powersports industry. They provide high quality, innovative, and advanced technology to seamlessly integrate bluetooth products into the overall riding experience. Tremendous growth accelerates exposure to challenges. Retailers saw that it was easy to make a profit by selling Sena’s products because of the high demand. This, combined with the freedom and flexibility of the internet marketplace, enabled non-authorized and less legitimate resellers to sell Sena products below the minimum advertised price, without any concern for the brand itself. One of the biggest challenge[s] Sena faced with this growth was “getting retailers to comply with their MAP policy,” said Rick Grassadonia, Director of Sales. It was hard to get the sellers to take their policy seriously. This stemmed from having an inefficient and inconsistent manual process. Every three days or so, Rick would jump online and search for violating sellers, primarily focusing on Amazon and eBay. It was impossible to identify resellers outside of the major marketplaces. Typically, he’d use spreadsheets to manage and organize sellers, their prices, and violating products. However, there was no solid way for monitoring MAP compliance and tracking everything that was going on, especially when communication mostly occurred over emails and the phone. This manual process led to enormous amounts of time being spent finding and contacting sellers, only to result in several customer complaints each week. THE JOURNEY After over three years of manually monitoring many sellers and products, Sena finally decided it was time to make the switch to software. During his research, Rick found the cost of MAP monitoring software to be incredibly expensive, until he found Trade Vitality. He immediately presented Trade Vitality to the management team. They said yes without hesitation, understanding what Rick was up against every single day with the complaints that were coming through. Management saw that this would make much better use of his valuable time and add efficiency to an otherwise cumbersome process. Aside from the affordability and time savings, Rick chose Trade Vitality because of the team. Working with team members who had hands on experience with both the brand side and the seller side meant Rick was supported by individuals who understood the bigger picture, and could relate and address specific bottlenecks and pain points that both sides experienced. While discussing his interactions with Joe of Trade Vitality, Rick remarks that “[it’s a] huge benefit. When I talk [to him], he gets it, he understands - all of the complications [of a MAP policy]”. THE SOLUTION & IMPLEMENTATION Trade Vitality was incorporated into Sena’s MAP monitoring workflow and was fully functional within 2-3 days. This included adding Sena’s products to the dashboard, finding their sellers, and creating email templates for violation notifications. Previously, sellers believed Sena wouldn’t do anything when they advertised below the minimum price because there was no consistency and follow-through with their policy. So they ended up ignoring warnings or notifications and basically not taking it seriously. Now, more sellers are paying attention and taking action because they see that Sena is proactively monitoring their policy. Since inviting Trade Vitality to create a more efficient and effective MAP monitoring process, Sena increased their productivity by 400%! Instead of receiving complaints on the phone and in emails, they’re receiving more and more positive comments and feedback on the improvements they’ve made. 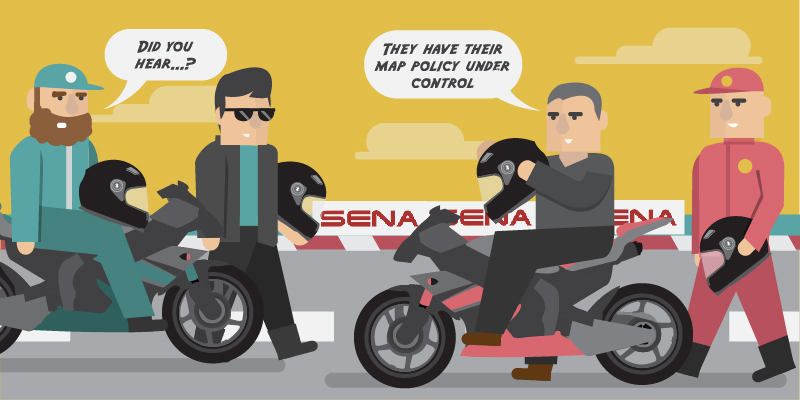 Sena feels confident that they have a handle on their MAP policy once again, and their dealers are reaping the benefits of selling a product that is guaranteed to give them the return they deserve for investing their time and expertise. Trade Vitality is an online dashboard for MAP policy monitoring and enforcement.